→How to drive traffic to your blog through Reddit? Do you know about Reddit?If your answer is something like -“No.I haven’t even heard about it” then this post is really helpful for you because you can use Reddit for driving Quality traffic to your blog.You can also get quality backlink and that too for free as well.It means that Reddit is really helpful for bloggers.Most of us use either Facebook,Twitter or Google Plus for promoting our blog or poduct.In this article,i will show you how to use this powerful tool for driving quality traffic to your blog. 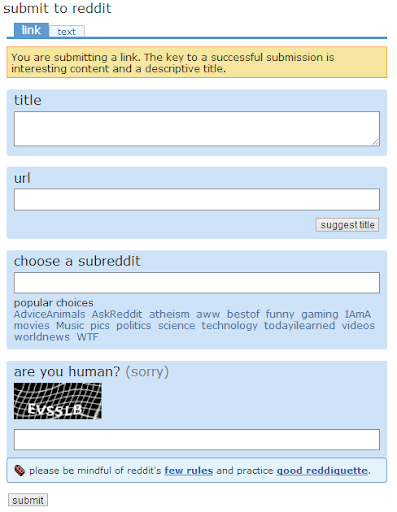 If you are totally new to Reddit,click on Sign Up link and create a new user account.After creating your user account,you would be able to submit your link.As written above,moderators and readers will read your post and will give their response through votes.At the same time,you can also vote for other members(if you think that their article is better).To get the exposure,you must use catchy titles otherwise people will never read your article.Each entry in Reddit is known as Subreddits.The homepage only displays the selected contents.Normally,people only visit the links present on front page so your article must get a place there. I already cleared this fact that it is the front page where your links get maximum exposure and thus the traffic so you must create catchy headlines.Your title should create a curiosity.Normally,reddit autmatically suggest you a title but you can also add your own title.While doing so,make sure that you add one or more keywords.People will click on your headline/title and will add positive or negative vote or comment on your submission page.Only Positive feedback will move your content to the front page.If you want to get positive votes then you must share a quality article and that too in most suitable category.Placing your article in proper category is also important because most of the time people waste their content by placing it in wrong category. Friends on Reddit can also help you in driving traffic to your blog.The process of adding friend on Reddit is very easy.Just move to the User Profile and click on “+friends” link.If you liked the profile and want to connect then press the option and he/she will be aded to your friend list.Try to join people related to your niche.Ask them to visit your post,vote it and comment on it.Do the same for other as well in return.You score points on reddit for doing that which is named as “Karma”. Very Few people know about Reddit so it was my effort to provide some information about it through this post which is titled as “How to drive traffic to your blog through reddit?”.It is completely free so you can try it without any issue.Just give it a try and check whether it is helpful or not. If you know about other such networks or websites then suggest me through your comments.